Mark your calendar for GIS Day 2014—Wednesday, November 19. On that day registered event hosts worldwide will welcome the geospatially savvy and inexperienced alike for a day—or several days—of passion for all things GIS. This worldwide grassroots celebration provides an international forum for users to demonstrate—and learn about—real-world applications that are improving daily life everywhere. The 2013 GIS Day, one of the biggest ever, boasted more than 1,000 hosts and 105,000 people attending events in 98 countries around the world. And event planners expect this year’s festivities to draw even more participants—whether attendees, hosts, or volunteers. Planning for 2014 already has begun at many venues, including government agencies, high schools, colleges, public libraries, community centers, and workplaces. As in the past, GIS Day activities will take a variety of forms: hands-on technology training and workshops, demonstrations, exhibitions, corporate or civic open houses, map gallery tours, and expos on careers in GIS. All these options are open to you as you embark on planning your GIS Day. 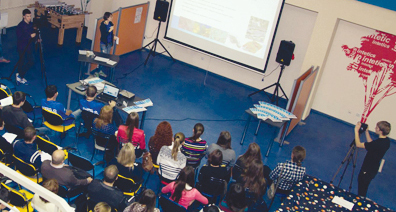 2013 GIS Day in the Ukraine. Perhaps the best place to find tools for developing and publicizing an educational, fun, and state-of-the-art event is the official GIS Day website, gisday.com. First, register your event. Then explore the site for free resources you can tailor to the GIS community and demographic you are trying to reach while drumming up maximum anticipation and excitement months ahead of the event. These include logos, flyers, posters, postcards, PowerPoint presentations, desktop backgrounds, and certificates of participation. Introduced last year, web templates allow event hosts to create a GIS Day page on their website to provide specific information about their local event. The template has the same design as gisday.com to keep the same look and feel of GIS Day but leaves you with the ability to customize, including adding your own pictures and event information. There are also giveaway items, including coloring pencils, magnets, and water bottles. In addition, there are free sets of age-appropriate activities to use during your GIS Day festivities, such as historical maps, geocaching, and e-books. If you are attending the 2014 Esri International User Conference, stop by the GIS Day interactive booth in Hall D of the San Diego Convention Center. Meet the GIS Day team and discuss your event plans. We are happy to help you with ideas for your GIS Day event, including suggestions for activities and promotion. The first formal GIS Day took place in 1999. Esri president and cofounder Jack Dangermond credits Ralph Nader with being the person who inspired the creation of GIS Day. Nader considered GIS Day a good initiative for people to learn about geography and the uses of GIS. He wanted GIS Day to be a grassroots effort and open to everyone to participate. The event traditionally is held the third Wednesday of November each year during Geography Awareness Week, a geographic literacy initiative sponsored by the National Geographic Society.